Steak weights are used to speed up the grilling time for thick cuts of meat without ruining the quality of the product. The steak weight, sometimes called a steak press, is particularly useful for well-done orders as it keeps service times moving at a reasonable pace. Simple to use, the steak weight is a useful tool for steakhouses, neighborhood grills, home use and any other food service operation serving up steaks and hamburgers on a regular basis. To use, simply place a steak weight on top of grilling meat. The force of the weight pushes down on the steak, while the weight itself retains the heat coming off of the grill and the meat itself. This heat is transferred back to the meat and assists in speeding up the cooking process. Steak weights also contribute to equal heat distribution for an evenly cooked steak or burger. Cast Iron vs. Aluminum: Steak weights are made with one of two materials, cast iron or aluminum. Cast iron is best for cooks who will be using the steak weight on a regular basis. Although cast iron and aluminum are both excellent heat conductors, cast iron retains the most heat and will be most effective in speedy situations. Cast iron is also very durable and will endure heavy use. Aluminum steak weights are perfect for occasional use. Aluminum will heat up and cool down very quickly, but it is not as durable as cast iron and may start to show signs of wear after heavy use. Prevent cross-contamination and flavor transfer by washing your steak weight after each use. To clean, operators can use one of two methods, although one is more thorough and highly recommended. 1. Recommended Cleaning Method: Allow the steak weight to cool off and clean off the surface with hot water and a stiff brush. 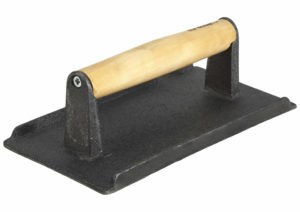 Do not use a grill brush to clean off the steak weight as this is too abrasive, especially for cast iron steak weights. 2. Cleaning in a Hurry: Place the steak weight face down on the grill. The leftover residue on the surface of the steak weight will do one of two things: burn into a crust on the weight or it will burn to a crisp and will fall off of the weight. If the residue burns onto the weight, take a grill scraper and scrape everything off. It should flake off easily. Remember to use an oven mitt or thick towel when handling a steak weight on the grill as the area around the handle will get very, very hot. To keep steaks and burgers flying off the grill in busy restaurants, it is recommended to purchase a few steak weights to keep in rotation. Whether you have the occasional well-done order or if you have a high demand for very cooked meat, a steak weight proves itself an asset in any kitchen that grills up meat on a regular basis.